The Darkside has truly taken Lord Vader as he robs a bank in New York. Of course, I'd think that he'd be using a lightsaber instead of that Glock. 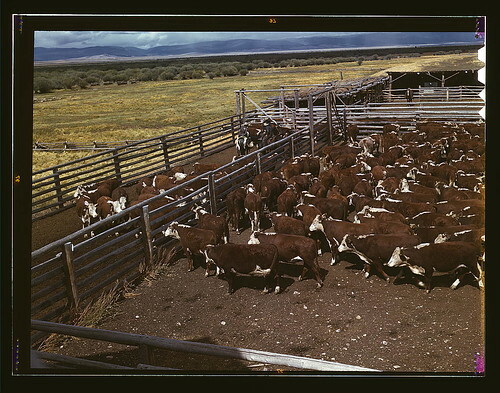 Cattle in corral waiting to be weighed before being trailed to railroad, Beaverhead County, Montana (LOC), originally uploaded by The Library of Congress. A great Russell Lee shot of life in 1942 Montana. Do you ever feel like the cows in the corral? Herded towards an unknown destination? I know that I do sometimes. "It's Monday, so I'm back at work"
"That's just the way we've always done it!" Even the best made plans can easily go astray as I'm sure that many of you can attest to. The shot that you are looking at is unfortunately NOT on a model railroad, but on the full-size Norfolk Southern Pocahontas Division in the mountains of West Viriginia at the small town of Keystone, WV. Cindy and I decided to go away for the weekend to our new favorite getaway at the Elkhorn Inn which is about 3 miles west of this photo location. Since part of the enjoyment of the location to me is watching and photographing trains, the derailment meant that while I got some unusual photos of the cars above (brand new clean on their sides), it also meant that the traffic was probably 25% of what it would of been on a normal weekend. While that usually would of been something that would of upset me, this weekend I did a really good job of just flowing with it. Less trains meant more time to read, time for a nice afternoon nap, and more conversation with our hosts. We had a wonderful weekend, it was just different from what I expected in the first place. On our way to West Virginia, we stopped at the Chateau Morrisette winery which is located just off of the Blue Ridge Parkway in Virginia. Take a look at their website at http://www.chateaumorrisette.com/ to see the beautiful property. Cindy and I had our first wine tasting adventure at the winery and found some great wines which we really liked. One thing that impressed us is that several of the wines have profits which partially go towards animal rescue groups. The winery is pet-friendly and you have to make sure to pet the dogs which roam the property. Next time we'll make time to have dinner on the property. The wooden watertank at the Rabun Gap Railroad Museum was created by the students at the neighboring school (famous for the Foxfire books) along with everything else. However, the museum is located on the old right of way of the Tocca Falls Railroad which ran from Georgia up to Franklin, NC. It makes you ponder the question about what is old. Done in sepia, the tank takes on an ageless status which betrays it's relative actual youth. I think that is part of the fun of making pictures.. finding the timelessness that remains. What is your work's mission? As I was listening to Jeff Curotos Camera Position #39 which was about finding "Your Mission & Your Audience" for your work, on my way into work this morning. As scary as there word "Mission Statement" is to someone like me who has been in Corporate America for the last 15+ years, the idea of discovering who and what you want your work to communicate is a really good idea. One of the concepts from the podcast is the fact that the first answer is always, "I make photographs for myself". However, we also plan on showing our photographs to other people. In my case, my family, other railfans and photographers, and the general public. You can even develop "missions" for different parts of your work. For example, if you are doing a series documenting old barns vs. portrait work that you do for family and friends. Each of these groupings might be seen by different groups. My standards for each group can be quite different even. For example, when I'm taking "railfan" shots to document a location compared to when I'm working on making a B&W image of an old depot or locomotive. The railfan shots are trying to convey a "time and place" while the B&W is aiming for more of a "timelessness"
I think the concept of "mission" develops as your work develops. I know that this has happened with me. As I get more serious about my photography, I see my "mission" changing and also the way that I want my work to be seen. As we go out on the roads for the holiday weekend, here is a reminder of how things used to be. That 18cent per gallon gas sounds pretty wonderful about now. Hope you have a wonderful 4th of July weekend and get a chance to make some photos.